DAVIS, Henry Winter, (cousin of David Davis), a Representative from Maryland; born in Annapolis, Md., August 16, 1817; was tutored privately; lived in Alexandria, Va. and Wilmington; returned to Maryland in 1827 with his father, who settled in Anne Arundel County; attended Wilmington College in 1826 and 1827; St. John's College, Annapolis, Md., and Hampden-Sydney College, Virginia; was graduated from Kenyon College, Gambier, Ohio, in 1837; studied law at the University of Virginia, Charlottesville, Va.; was admitted to the bar and commenced practice in Alexandria, Va.; in 1850 moved to Baltimore, Md., where he continued the practice of law and also engaged in literary pursuits; elected as the candidate of the American Party to the Thirty-fourth through Thirty-sixth Congresses (March 4, 1855-March 3, 1861); unsuccessful candidate for reelection in 1860 to the Thirty-seventh Congress; elected as an Unconditional Unionist to the Thirty-eighth Congress (March 4, 1863-March 3, 1865); chairman, Committee on Foreign Affairs (Thirty-eighth Congress); co-sponsor of the Wade-Davis bill of 1864; was not a candidate for renomination in 1864; died in Baltimore, Md., on December 30, 1865; interment in Greenmount Cemetery. Papers: 1817-1863, 1 box. Manuscript autobiography of Henry Winter Davis covering his early life at Annapolis, Kenyon College, and University of VA. Also a letter from A.Lincoln, Mar. 18, 1863, "not for publication", stressing importance of agreement among those U. S. Representatives supporting the Union, with regard to election of House Speaker. Papers: 1862, 1 page. A letter from Samuel Tyler to Henry Winter Davis written on May 21, 1862. In the letter, Samuel Tyler states his appreciation for Davis's criticism of his work. Papers: In the John Reese Kenly Papers, 1865, 1 page. A letter from Edwin M. Stanton to Henry Winter Davis written on April 8, 1865. In the letter, Edwin Stanton writes that he received Davis's note on Gen. [John R.] Kenly; assignments of command are made by commanding generals & not by War Dept. Edwin Stanton also writes that he will suggest to Gen. Grant his [Stanton's] wish that Kenly be assigned as Davis requests. Papers: In the Mercantile Library Association of Baltimore Records, 1839-1873, 3 boxes. The records include a letter from H. Winter Davis to Mr. Green on August 16, 1858. Papers: In the Henry Du Pont Papers, 1822-1899, 3 linear feet. Subjects include Henry Winter Davis. Papers: In the Samuel Francis Du Pont Papers, 1812-1865, 50 linear feet. Subjects include Henry Winter Davis. The collection also is available on microfilm. Papers: In the John A. J. Creswell Papers, ca. 1819-1885, 8 linear feet. 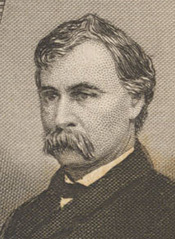 Correspondents include Henry Winter Davis. A finding aid is available in the library. Papers: In the B. F. Wade Papers, 1832-1881, approximately 3,522 items. Correspondents include H. Winter Davis. A finding aid is available in the library. Belz, Herman. "Henry Winter Davis and the Origins of Congressional Reconstruction." Maryland Historical Magazine 67 (Summer 1972): 129-43. Creswell, John A. J. (John Angel James). Oration on the life and character of Henry Winter Davis, by Hon. John A.J. Creswell. Delivered in the Hall of the House of Representatives, February 22, 1866. Washington: Government Printing Office, 1866. Davis, Henry Winter. Address of Henry Winter Davis. [Baltimore? : N.p., 1861]. ------. Election of speaker. Speech of Hon. H. Winter Davis, of Maryland. Delivered in the House of Representatives, February 21, 1860. [Washington]: Printed by L. Towers, . ------. An epistle congratulatory to the right reverend the bishops of the Episcopal court at Camden. From Ulric von Hütten [pseud.] ... [New-York: N.p., 1853]. ------. Kansas contested election. [Washington: Printed at the office of the Congressional Globe, 1856]. ------. Oration of Hon. Henry Winter Davis ... delivered at the great Sanitary hall, July 4th, 1865. Chicago: Tribune Book and Job Printing Office, 1865. ------. The origin, principles and purposes of the American party. [N.p., 1855]. ------. A plea for the country against the sections. Washington: American Organ, print., 1856. ------. The southern rebellion, and the constitutional powers of the republic for its suppression. [New York: E. D. Barker, 1861]. ------. Speech of Hon. Henry Winter Davis at Concert Hall, Philadelphia, September 24, 1863. [Philadelphia: N.p., 1863]. ------. Speech of Hon. Henry Winter Davis, of Maryland, against the admission of Kansas under the Lecompton Constitution. [Washington]: Printed by L. Towers, . ------. Speech of Hon. Henry Winter Davis, of Maryland, and the debate on his amendments to the miscellaneous bill, prohibiting the trial of citizens by military commissions. In the House of Representatives, March 2 and 3, 1865. Washington: Printed by L. Towers, 1865. ------. Speech of Hon. H. Winter Davis of Maryland, before the electors of the fourth congressional district of Maryland, at the new assembly rooms September 27, 1860. [N.p., 1860]. ------. Speech of Hon. Henry W. Davis, of Maryland, in the House of Representatives, May 15, 1856, on the bill defining the duties of commissioners of elections in the city of Washington, and for other purposes. Washington: American Organ, Print, 1856. ------. Speech of Hon. H. Winter Davis, of Maryland, on the expulsion of Mr. Long. [Washington: Printed by L. Towers for the Union Congressional Committee, 1864]. ------. Speech of Hon. H. Winter Davis, of Maryland, on the resolution offered by Mr. Colfax proposing the expulsion of Mr. Long. [Washington: Printed by L. Towers & Co., 1864]. ------. Speeches and addresses delivered in the Congress of the United States, and on several public occasions [1856-1865]. New York: Harper & Brothers, 1867. ------. Speeches of Hon. Henry Winter Davis, of Maryland, on his bill for a Board of admiralty, in Navy department. Delivered in the House of Representatives, February 3 and 6, 1865. Washington: Printed by L. Towers, 1865. ------. The war of Ozmuzd and Ahriman in the Nineteenth Century. Baltimore: J. S. Waters, 1852. Henig, Gerald S. Henry Winter Davis: Antebellum and Civil War Congressman From Maryland. Boston: Twayne, 1973. ------. "Henry Winter Davis: A Biography." Ph.D. diss., City University of New York, 1971. ------. "Henry Winter Davis and the Speakership Contest of 1859-1860." Maryland Historical Magazine 68 (Spring 1973): 1-19. Luthin, Reinhard H. "A Discordant Chapter in Lincoln's Administration: The Davis-Blair Controversy." Maryland Historical Magazine 39 (March 1944): 25-48. Steiner, Bernard C. Life of Henry Winter Davis. Baltimore: John Murphy, 1916. Stewart, James Augustus. Maryland politics and the election of speaker. Speech of Hon. Jas. A. Stewart, in reply to Hon. Henry Winter Davis. Delivered in the House of Representatives, June 2, 1860. [Washington]: T. McGill, printer, . Tyson, Raymond W. "Henry Winter Davis: Orator For the Union." Maryland Historical Magazine 58 (March 1963): 1-19. ------. "A Southerner Who Spoke For the Union." Southern Speech Journal 30 (Winter 1964): 117-32. United States. 35th Congress, 1st session, 1857-1858. House. Speeches of Hon. H. Marshall, of Kentucky, and Hon. H. Winter Davis, of Maryland, on the bill regulating municipal elections in the city of Washington. Delivered in the House of Representatives, May 23, 1858. [Washington, D.C.]: Printed by L. Towers, .